It may look like ordinary tile floor and carpet from your height, but deep down at ground level, it’s a jungle of dirt, pollen and dust; a refuge for tobacco smoke particles and pet dander. At the touch of a button the LaserEye sets out for the hunt. Slowly, it turns, calmly surveying all in its territory; mapping and memorizing the floor plan as it sets out for 120 minutes of continuous cleaning. LaserEye is the most advanced robot floor cleaner on the market today, yet is it still more affordable than others. Using its 3D mapping laser, the robotic vacuum can detect objects as small as 1 inch in real time, and make adjustments to its cleaning pattern to avoid them. Use the Rollibot App to view progress and issue commands to your LaserEye. You can even see a map of your floor plan, and direct the LaserEye to clean anywhere by simply sliding your finger to the desired location on the 2D map! LaserEye is programmed with a proprietary SLAM algorithm software designed for simultaneous localization and mapping, allowing it to remember where it has already done its job and where it hasn’t cleaned yet. LaserEye doesn’t just clean your floor, it purifies the air! Its powerful suction area pulls in air and traps allergens and small particles in its HEPA air filter, creating a clean living environment. And maintaining your RolliBot is a breeze! To clean the extra large 11.8oz dust bin, simply dump out the contents, rinse, and your LaserEye is ready to go! 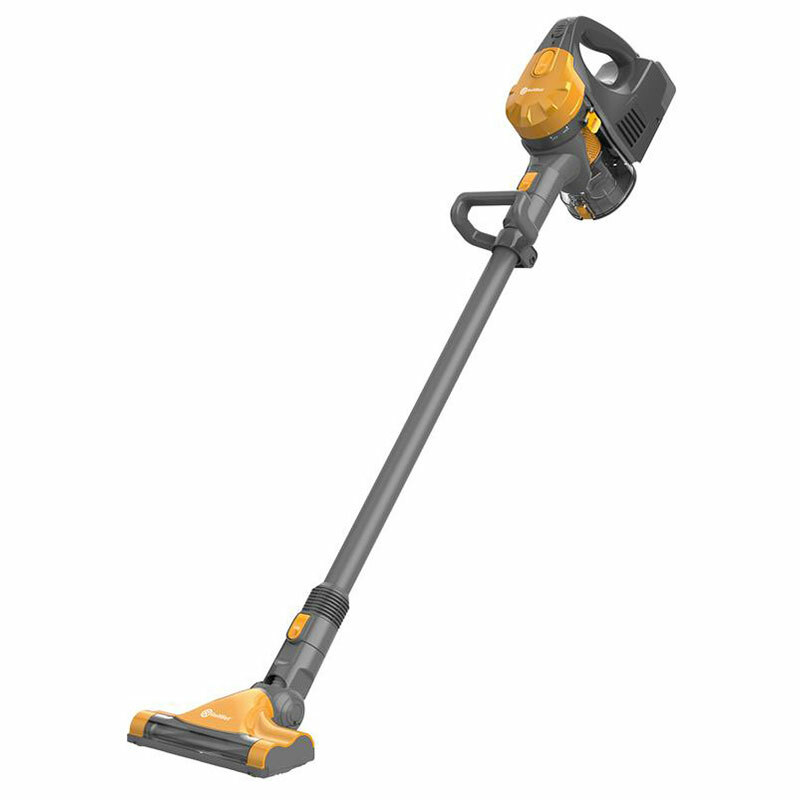 CLEANS AUTOMATICALLY – LaserEye begins sweeping and vacuuming at the touch of a button using the LED control panel on the unit, wireless remote, or phone app. WORKS ON EVERY SURFACE – It cleans carpet, hardwood, laminate flooring, linoleum, and ceramic tile. SCHEDULED CLEANING – LaserEye can be programmed to start cleaning at the time that works best for your life. EXTENDED BATTERY LIFE – One charge lasts for 90-120 minutes of hassle free cleaning time. EXTRA LARGE DUSTBIN – LaserEye uses an 11.8oz washable dustbin and brush for quick and easy cleanup. Just dump, rinse, and get on with your day! AUTOMATIC CHARGING – After cleaning, LaserEye automatically returns to its charging station and prepares to tackle the next big mess. 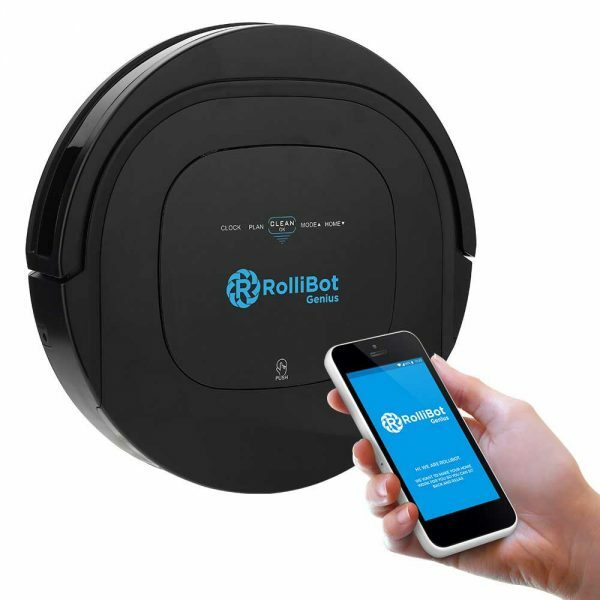 1-YEAR WARRANTY – You can buy any RolliBot product with confidence. There is a 1-year limited warranty included with your purchase of LaserEye. APP ENABLED for IOS/ANDROID – Use the App to start/stop cleaning, cycle through cleaning modes, set a cleaning schedule, or even send the LaserEye to clean a specific area in your home on the 2D map of your floorplan. SLAM SOFTWARE – A special software algorithm designed for simultaneous localization and mapping of your floor plan. It learns as it cleans! 3D MAPPING – The LaserEye’s 3D laser scanning actively maps space around it, tracks its progress and determines the most efficient cleaning patterns all while locating obstacles to avoid in real time! NO RANDOM ZIG-ZAGS – The LaserEye’s ultra-smart navigational elements allow it to clean using methodical, logical movements in every space in your home. No random zig-zags! INFRARED DROP SENSORS – LaserEye uses built-in infrared sensors to detect stairs and drops in bi-level living spaces. 2 CARPET AGITATORS – Works hard to clean deep into carpet pulling dust and debris upward towards the powerful vacuum.